Less than 10 miles north of Acre is the town of Nahariya. On the way, you can visit Kibbutz Lohamei HaGhettaot ("The Ghetto Fighters"). This kibbutz was founded in 1949 by survivors of the Holocaust, mostly from Poland and Lithuania. The kibbutz maintains a wonderful museum and archive dedicated to the Holocaust and Jewish resistance. 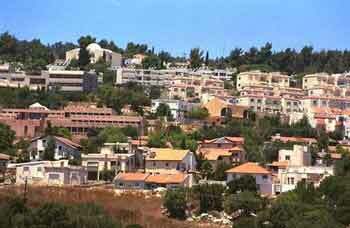 Nahariya itself is a resort town, which was founded by German Jews in 1934. Yet more beautiful beaches can be found here, along with great conditions for sailing and windsurfing (the world championships were held there in 1980). 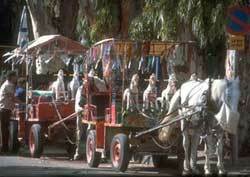 The city also has a fine museum of art and archaeology and visitors can enjoy rides in horse-drawn carriages. In the 1940s, Nahariya was a landing spot for illegal immigrant ships. Instead of refugees, missiles landed in the city in the 1980s when it became a target of Katyusha rockets fired by Palestinians in Lebanon in what became the Lebanon War. Today, the city of roughly 30,000 people is a popular place for UN peacekeeping troops from Lebanon to go for R&R. A little beyond the city limits is the beach at Akhziv, which is part of a national park. This was once an important settlement and station on the ancient coastal road that linked Egypt and Phoenicia. Jews have lived here since the Second Temple period. The Crusaders built a castle here and called it Le'imbert. Opposite the water is a hill on which Kibbutz Haziv sits. The kibbutz is one of the largest turkey breeders in the country. It is more famous in Israel for its association with an incident during the British mandate. In June 1946, the Haganah simultaneously blew up 11 bridges linking Palestine with neighboring Arab countries. One team was to blow up the Achziv bridge, but was spotted by British soldiers who fired on them. One of the bullets inadvertently hit the explosives the Jews were carrying and set them off. The explosion blew up the bridge, but killed 14 men as well. Ma'alot is an immigrant town 11 miles east of Nahariya was founded in 1957. This small town made world headlines when a group of 11th graders on a field trip from Safed spent the night in a school in Ma'alot. On May 15, 1974, three PLO terrorists disguised in Israeli uniforms, who had infiltrated from Lebanon, killed the school children's guard and stormed the building. Some children were killed as the terrorists entered, others escaped through a window on the second floor. The terrorists threatened to kill the remaining children unless Israel released Arab terrorists held in Israeli prisons. Israel's official policy was not to negotiate with terrorists, but the government decided to ask for more time to talk. The terrorists rejected the request. Fifteen minutes before the terrorist-imposed deadline for starting to kill their hostages, an elite Golani brigade unit mounted a rescue operation. When it was over all the terrorists were dead, but so were 21 children who had been murdered by the Arabs. In 1963, Ma'alot merged with Tarshiha, a 900-year-old neighboring Muslim and Christian Arab village to form a single municipality. This a rare model of interdependence and cooperation between Jews and Arabs. Today, the population is approximately 17,500; 13,000 in Ma'alot, 4,500 in Tarshiha. An interesting site that is roughly in between Nahariya and Ma'alot is Montfort Castle, a fortress built by French Crusaders. 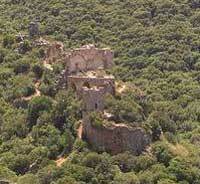 Like many such castles, it changed hands between Saladin's army (in 1187) and other Crusaders (1192). German Knights of the Teutonic Order bought the fortress, translated the French name (which means "strong hill") to Starkenberg, and further fortified it, but it wasconquered nevertheless by the Mamluk Sultan Baybars in 1271 who, in a rare show of humanity for that age, allowed the inhabitants to leave with their possessions. It's a good half-hour hike to the castle and there are a number of trails for longer hikes in the surrounding countryside. If you're into Crusader fortresses, you might also want to visit Yehi'am (Judin) Castle, which is less than eight miles east of Nahariya. This was probably built around the 12th century to guard the road from Akko into Lebanon. As in the case of Montfort, the Teutons took over the castle in the 13th century and lost it a few decades later to the Mamluks. It was used into the eighteenth century by the Bedouin ruler Dahar El-Amer, who conquered the Galilee. Jewish settlers came to the area in 1946 and established a kibbutz, which was named after Yehiam Weitz, a member who was killed during an operation against the British in which the Akhziv Bridge was blown up. A visitor in 1940 gives a sense of the conditions the Jews encountered, "The fortress is in ruins but it stands in a beautiful place and dominates the surroundings. There is no water, only empty cisterns. The soil is hard but some of it can be cultivated, adn there is no road...."
When the UN voted to partition Palestine in 1947, Nahariya and several other Jewish settlements were in the territory assigned to the Arab state. The western Galilee was cut off from the Jews in Haifa and it its suburbs and these northern settlements were isolated from each other. Yehi'am was one of these isolated outposts. On March 26, 1948, a convoy of home-made armored trucks bringing supplies and reinforcements to Yehi'am from Haifa was ambushed by Arab gangs and 47 of the Haganah fighters were killed in the ensuing battle. Later, in May, a convoy broke the Arab blockade. Today, a monument stands at the junction where the convoy battle was fought, with burnt cars and trucks left as a reminder of the carnage. Though it's not on most tourists' itineraries, the Tefen Industrial Park, a short drive from Ma'alot, is also a fascinating place to visit. No, it's not a collection of factories; well, not exactly. Actually, it is a kind of cooperative incubator for new businesses founded by industrialist Stef Wertheimer. The industrial park was designed to help innovative and creative people start businesses with the advantage of sharing the cost of much of the infrastructure and many services. What really sets Tefen apart, however, is Wertheimer's view of the interrelationship between artistic and entrepreneurial creativity. The park is filled with sculptures and gardens. It also has an art museum, a museum of German Jewry and an exhibition of vintage cars.